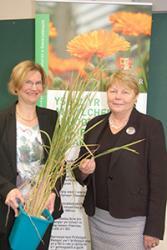 Dr Katherine Steele shows Baroness Randerson an example of a new variety of riceWales Office Minister Baroness Randerson, visited Bangor University (Thursday 27 November) to find out about the exciting and innovative environmental research taking place. Baroness Randerson was particularly keen to learn about a vital research project at the School, which is addressing food security in India and Nepal. Food Security is one of the major challenges facing the world. Scientists on the project are working with partners in Nepal, India and LGC Genomics (LGC is an international life sciences measurement and testing company, building leading positions in sustainably growing markets) to develop new strains of rice that are more able to withstand two devastating rice diseases which have the capacity to lead to the loss of 85-100% of the rice harvest in many rice growing countries and thereby, food security for millions. This new Agri-Tech Catalyst Early Stage Feasibility Award funded project, which is subject to contract, is one of three projects in Wales sharing £5 million of investment from Innovate UK to address major worldwide agricultural challenges. During the visit Baroness Randerson also had a meeting with University Vice- Chancellor Professor John G Hughes to discuss the University’s ground-breaking work in areas of sustainability and environmental science. “I’ve really valued the opportunity to discuss with academics and researchers at Bangor University their research which is helping to address food security. This work is of international significance and, in particular, of importance to the future of some of the poorest places on our planet. "Our research follows on from a long tradition of work in Bangor that has benefitted agriculture throughout the tropics and has had a genuine, positive impact upon society. Novel strategies of breeding new varieties of rice, maize and millet have resulted in improved varieties being grown on more than 3M hectares of agricultural land, estimated to provide benefits of around £36M annually to the poorest farming households in marginal areas of South Asia." Baroness Randerson also visited the Centre for Ecology & Hydrology, part of the Natural Environment Research Council, who also work alongside the University’s own environmental scientists in the Environment Centre Wales building. The award-winning green building is designed to inspire and reflect the innovative environmental research by over 100 CEH and Bangor University staff it houses. 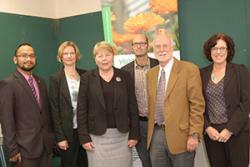 Baroness Randerson toured the analytical facilities and met staff and students to hear about food security projects. These include a new Agricultural Sustainable Intensification Platform, part of a £5M Defra programme to develop innovative farming practices which protect natural resources, and a £9M Welsh Glastir agri-environment evaluation scheme.